Very few people could really identify what a good Antivirus does. You may ask, “Why do you think that? Isn’t an Antivirus’ job to prevent you from getting infected with computer viruses and slowing down your computer – or worse, destroy your data?” Yes that’s its job, but doing its job doesn’t necessarily mean it’s good. With all the competing free and paid versions of malware protection out there, there’s a demand for software that’s robust and easy-to-use. And perhaps most importantly – it needs to be an Antivirus that’s not always in your face when its not needed. That said, we’ve been impressed by Norton’s new editions of its security software so far – even finding the Norton 360 All-In-One (Ver 5.0) Security somewhat impressive on our review. 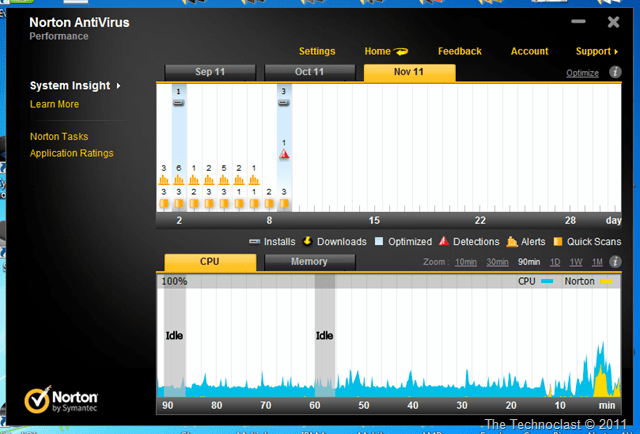 This time, we’ll be checking out the Norton AntiVirus 2012 – which by all aspects, is like the All-In-One’s little brother. Does it live up to the same expectations? Find out in our review below. As with the Norton 360 before it, installation for the Norton AntiVirus 2012 could not have been any easier. You plug the disc in and hit Install. It’s so simple that first time PC users wouldn’t have a problem getting through it. Once you’re done – in literally 2-3 minutes – you’re up and running. There’s no need to tweak any settings, set up a scan schedule, or find the help button or pick up a manual. Apart from registering your software, the AntiVirus will leave you completely alone to do your business as you see fit. In fact, you’ll barely notice Norton’s there – until such time when it gives you certain innocuous notifications to any activities or problems it might be noticing. Of course, the best part about these notifications is that they’re non-intrusive. Norton will just give you a small window on the lower right of your screen if it wants to tell you something – and if the issue doesn’t bother you then you can just continue on your tasks and it will disappear. It will mostly give you notice on certain things like an application using up high CPU resources, if a scan has been completed, or even giving you a red window if you plugged in a virus-infected device – which is exactly what happened to us recently with a USB stick. Since we cover a lot of tech-related events, we get access to USB sticks a lot. These generally contain press releases and product images from companies so they’re what you would call an “occupational risk” in terms of keeping unknown USB sources at bay. While generally we found USB drives from companies safe and clean from viruses, we received one recently that had an anomalous autorun file. Norton, without fail, quickly threw up a red notification windows and told us about the questionable file and stopped it from running. We copied the press materials as this happened, and then eventually Norton Quarantined the problem. All throughout, we didn’t notice a dip in system performance – a feat that not a lot of AntiVirus software could perform. Some would even lock out entire USB drives or even fail to notice the problem before the harm has been done. 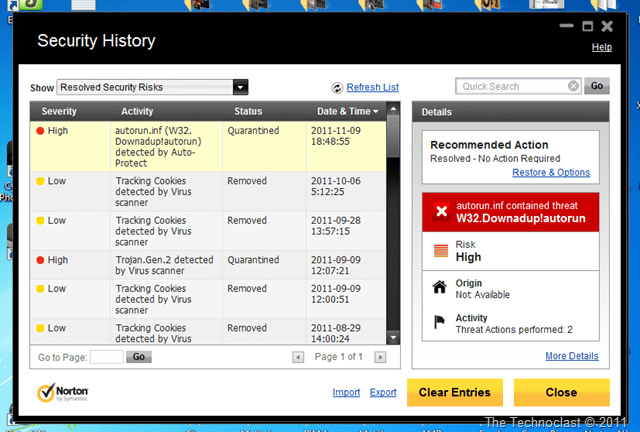 Worse, some security software will actually not check on drives like these unless you explicitly tell them to. Had it not been for a Norton product, we might be infected right now and we might not even know it. 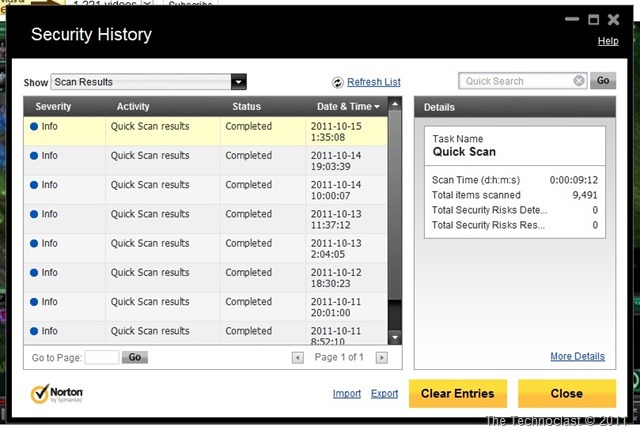 One of the most useful features of Norton Antivirus 2012 has got to be the Idle Time Scan. Periodically, when the software realizes that your computer has been idle – such as when you step out for coffee or lunch – then it’ll start an Idle Scan for viruses. Once you return, Norton stops the scan and gives you a reassuring notification that your system has just been scanned and is in tip-top condition. This is probably the best way to handle scanning as it doesn’t interfere with your work – because as we know most anti-malware solutions will have a forced scheduled scan that kicks in at the most inopportune times. Norton AV’s bigger brother, the Norton 360 All-In-One Security, has some extra features that the little sibling doesn’t – like hacking protection, online backups, PC tuning, web filtering, and Parental Controls. However, if you don’t need those extra features and just want a robust antivirus system that does its job, then you’ll be perfectly at ease with the Norton Antivirus 2012. 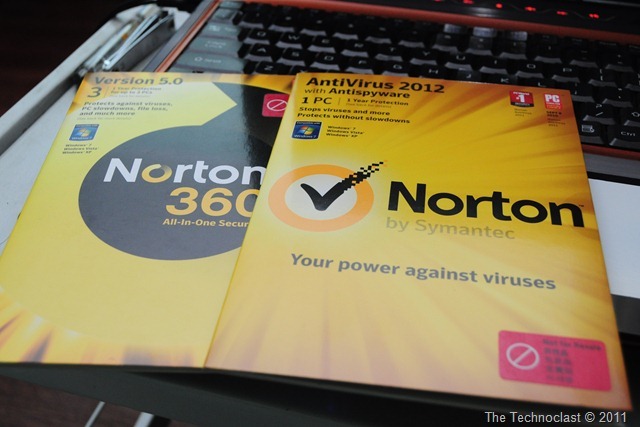 The Norton Antivirus 2012 is available in stores for PHP 990 which covers 1PC for 1 year. For anyone who values their data and computer’s security, it’s definitely a sound investment.